We live in a fundamentally changed world. It's time for your approach to strategy to change, too. The evidence is all around us. Extreme weather, driven by climate change, is shattering records all over the planet. Our natural resources are in greater demand than ever before as a billion more people enter the global middle class, wanting more of everything. Radical transparency is opening up company operations and supply chains to public scrutiny. This is not some futuristic scenario or model to debate, but today's reality. We've passed an economic tipping point. A weakening of the foundations of our planetary infrastructure is costing businesses dearly and putting our society at risk. The mega challenges of climate change, scarcity, and radical transparency threaten our ability to run an expanding global economy and are profoundly changing "business as usual." But they also offer unprecedented opportunities: multi-trillion-dollar markets are in play, and the winners of this new game will profit mightily. According to Andrew Winston, bestselling author (Green to Gold) and globally recognized business strategist, the way companies currently operate will not allow them to keep up with the current-and future-rate of change. They need to make the Big Pivot. 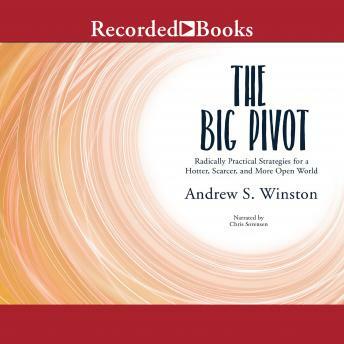 In this indispensable new book, Winston provides ten crucial strategies for leaders and companies ready to move boldly forward and win in this new reality. With concrete advice and tactics, and new stories from companies like British Telecom, Diageo, Dow, Ford, Nike, Unilever, Walmart, and many others, The Big Pivot will help you, and all of us, create more resilient businesses and a more prosperous world. This book is the blueprint to get you started.